My top tip for moving house in 2019? Think less about now and more of the future. The same applies when choosing your next car, so as we scout for some wheels to replace the fleetís 5008, Iíve assessed my ìhorizonî needs. While the Peugeotís been here, weíve gone from two drivers to four, my eldest children both binning the ëLí plates. So there are fewer and fewer moments when everyone assembles for an en masse jaunt. While space has been a joy, foregoing a seven-seater SUV for something less inter-generational will not be an illogical move. I have my eyes on one or two comparatively less urban alternatives: double cabs, as Iíve found in past trials, are excellent for nuclear units who still want a space to lob mountain bikes, ferry a child-ravaged sofa to the tip, or take the chickens to the vet. Theyíre also getting more and more refined (the double cabs, that is, not the chickens). 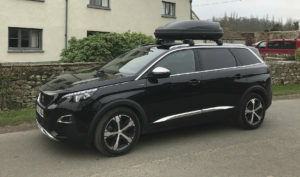 But all of this planning is mere distraction from a grim truth: whatever 2019 brings, the ticket is surely unlikely to be so club class as this 5008. Any search for an equivalent level of grace and favour in this sector, at this price, is a grim challenge. Love and SUV made enthusiastic bedfellows during our trial. However, as the clock ticks down, I realise my reports may have been more intoxicated by aura than soberly studious of the technical nitty-gritty. To redress that, Iíve been zooming in on some of the clever stuff you get as part of Peugeotís 5008 GT deal. Bear with me, as I can make a Luddite look like a NASA pilot. Letís start with trajectory correction. In my Morris Minor, I rely on my wife to do this, adding a touch to the steering if youíre blithely heading somewhere stupid. Here, your wife can stay at home. Ditto as per the threat of kamikaze overtakers or lane-lurkers, LED markers for blind-spot threats being, I guess, preferable technology to your partnerís finger-nails. Iíve also explored Active Lane Keeping Assistance. This is brilliant for its nips and tucks to road positioning, even if it ironically leads to more staring at binnacles and less at the road ahead. Thereís even spouse-replacing active cruise control. This spells hell for recidivist tailgaters, but joy if you value serene motorway progress, even on such helter-skelter sections as the divorce-threatening M4 between Magor and Duffryn. Back on country roads, my utmost favourite, however, is automatic headlight dipping. Itís rarely confused and works hard. An example to us all. The ultimate act of consumer journalism would be to test Peugeotís Connect SOS Assistance. This, should you crash and deploy the airbags, sends a handy location alert to the emergency services. As Meatloaf nearly said, ìI would do anything for Diesel Car, but I wonít do that.î Not deliberately, anyway. Dazzlingly good: automatic headlight dipping takes the faff out of nocturnal journeys on country lanes. Guzzlingly bad: short winter journeys have shredded any ambitions of breaking the 40mpg barrier.